Though Warner Bros. and DC Comics may have dominated Hall H this weekend, Fox also arrived with a flashy presentation including trailers for some of its most exciting superhero pics, including Deadpool and X-Men: Apocalypse. Now, a leaked version of the latter has arrived online, and we have it here for your viewing pleasure. The video, from AlphaNerd, is rather low-quality but features a lot of dialogue in place of flashy effects (as of Comic-Con, only five weeks of shooting had taken place). Nevertheless, the colossal scale of the X-Men pic, which will conclude the trilogy started by X-Men: First Class and X-Men: Days of Future Past, is fully imparted, and it’s clear that Apocalypse (Oscar Isaac) is an incredibly powerful villain the likes of which none of the characters have ever seen. Speaking of the titular villain, he can be glimpsed below in some recently released photos, courtesy of EW. As for the trailer, it’s an intense look at the film and the impression I’m getting from it is that Apocalypse is going to have a legitimate body count, with the ancient mutant infiltrating the ranks of the X-Men and working to tear them apart from the inside out. The trailer even gives a teaser for what could be a pivotal plot twist revolving around Charles Xavier (James McAvoy). X-Men: Apocalypse is directed by Bryan Singer. 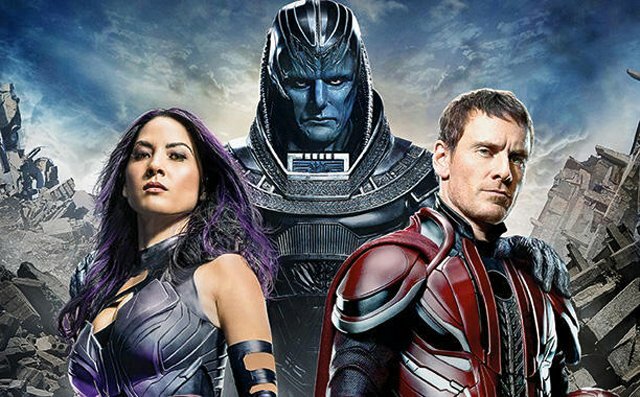 It stars McAvoy as Professor X, Isaac as Apocalypse, Michael Fassbender as Magneto, Jennifer Lawrence as Mystique, Nicholas Hoult as Beast, Sophie Turner as Jean Grey, Kodi Smit-McPhee as Nightcrawler, Olivia Munn as Psylocke, Evan Peters as Quicksilver, Rose Byrne as Moira MacTaggery, Tye Sheridan as Cyclops, Lucas Till as Havoc, Alexandra Shipp as Storm, Lana Condor as Jubilee, Ben Hardy as Angel and Tómas Lemarquis as Caliban. The pic opens May 27, 2016.